Kyle Haley, 24, of Rangeley, started off taking photos using disposable cameras when he was younger, then graduated to a point-and-shoot digital camera and the rest is history. 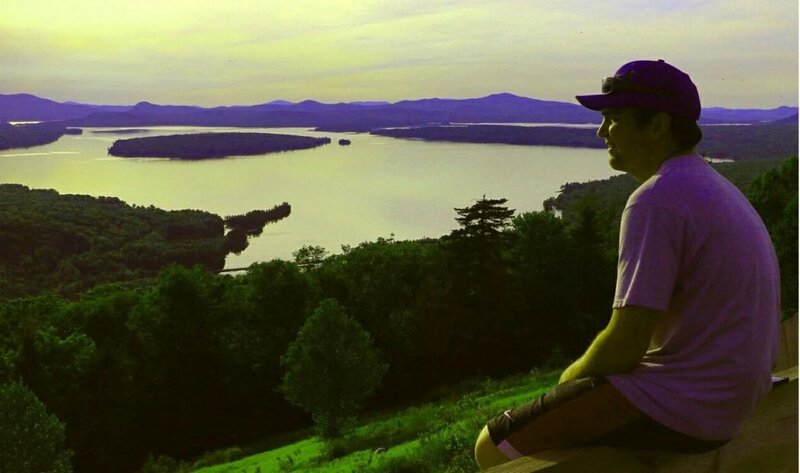 The 2012 graduate of Rangeley Lakes Regional School fell in love with taking landscape photos when he was on a trip to Alaska. The Rangeley native works at M & H Construction and approaches both interests in a similar fashion at times. “Mixing construction work and photography might seem like two different areas for most, but I find certain aspects from each are universal,” Haley said. How did you get into photography? When I was real young I used to take photos all the time with those disposable cameras that many stores would sell. I grew up around construction equipment so I used to take many photos of them working. As the years progressed, when the point-and-shoot digital cameras were first coming out, I ended up getting one of those and used to take many photos when on vacation. One trip to Alaska I took around 6,000 images with the original point-and-shoot style. That is where my love for landscape photography began. As high school came around I picked up a couple graphics classes and Mrs. Emami introduced me to DSLRs (digital single-lens reflex cameras) in those classes. That brought a whole new level of photography to the table for me. I learned many new techniques with those cameras that I was able to apply to my knack for landscape. Growing up in Rangeley there was always great scenery to capture, so after high school I started capturing more areas of our region and sharing the images online. What goes into capturing landscape images? A lot of it to me is visual. I form a vision of what I want the photo to look like, based on the scenery that is present, and then I will shoot different angles of it, so when I review the photos later for processing I can get the right visual I was trying to share. There are many more areas, such as nailing the shutter speed, ISO and aperture, so that you have the proper exposure and depth of field as well. They surely all work together, but for me it all starts with the right visual. Do you have a specific type camera you like to use? I have always been using Canon cameras for the most part. I had one Kodak back when the first point-and-shoot digital cameras were rolling out, but all my DSLRs were Canon. It is what I grew up on and learned on, and the fact that I have quite a bit of Canon lenses plays a big part in me being a Canon shooter. I currently shoot with the new Canon 6D Mark II, which is a full-frame sensor that I just started shooting with this year. So far I really like the full-frame sensor. Prior to that I was mainly on crop-sensor bodies such as the 70D. How did you get the northern light image from the top of Quill Hill? That particular capture was a spur of the moment decision. I recalled hearing on the news earlier in the day about the northern lights and how they were expected to be visible that night due to a recent solar event. I grabbed my camera and drove up to Quill Hill. This was back before Quill Hill was a really popular car ride in the area and the overlook was still being constructed. I recall it being windy and really cold that night but clear nonetheless. About 30 degrees. I set up my camera and the tripod that I had with me did not happen to fit the mount I had on my camera at the time, so I ended up having to shoot that 25-second exposure off a wooden bench using my Leatherman under the lens to prop it up toward the sky. It ended up coming out pretty decent considering all the circumstances. It was a unique shot and a lot of people seem to enjoy the photo. What is your favorite subject to photograph? I enjoy shooting the Saddleback Mountain area the most. I have a passion for mountains, so I enjoy hiking up there and finding unique shoots. One of my favorite images last year I captured up there. The Milky Way rising up over the lupine patch near the base lodge: I had been visualizing that image in my head for almost 5 years and finally the conditions were just right that night to make it work. Where do you display your images? I display my images mainly online through my Facebook page and also my website www.khaleyphoto.com, where all my images are broken down in galleries. 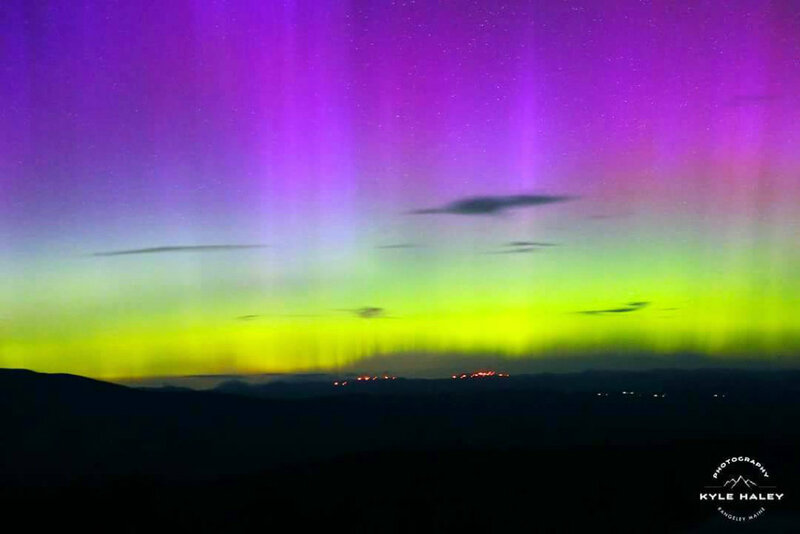 Kyle Haley’s “The Northern Lights” is seen in full color over East Kennebago and Kibby Mountain as seen from Quill Hill in September of 2014. 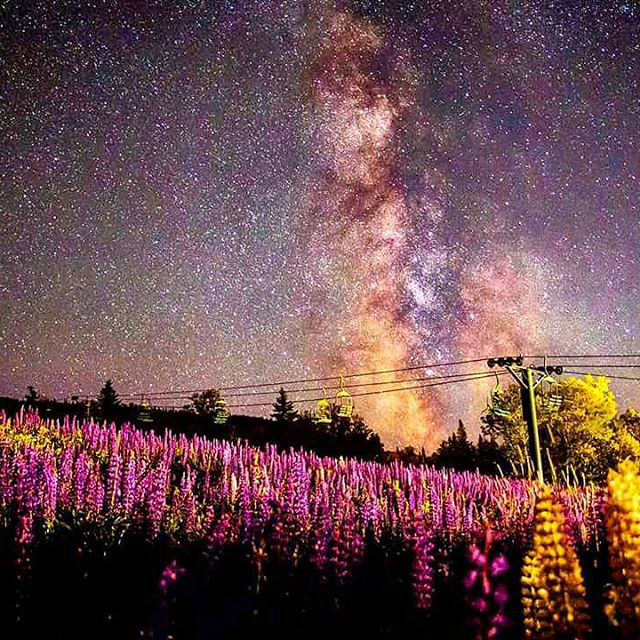 Lupine under the Milky Way at Saddleback Ski Area taken by Kyle Haley.